1. 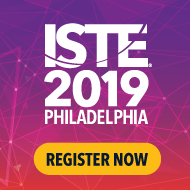 Discount on ISTE Standards resources - Digital Learning Pathways! Through November 15th you can use the code "celebrate!" at check-out to get 15% off the "Digital Citizen" Digital Learning Pathway or the 3 unit bundle that includes "Digital Citizen," "Empowered Learner," and "Knowledge Constructor"! The Digital Learning Pathways are collections of learning resources built on research-based best practices in education and provide a deep dive into what the ISTE Standards look like in the classroom. For more info, go to istestandardspd.org.